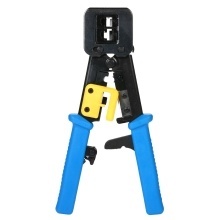 This network pliers has the functions of crimping, stripping and disconnecting. Multifunction in one, practical and convenient for use. Professional crimping pliers with wire cutter, cable stripper, and cable stripping blades. Precisely to crimp 8P/6P network cable connectors, not easy to damage the connector. Textured handles provide a non-slip grip for enhanced control and comfort. High quality blades, long-lasting durability and convenient to use.